The Skerries Skatepark Committee has undertaken the remit to not just obtain a skatepark facility for Skerries but to build one that will fit in with the environment and qualities that make Skerries special. Their top of class design ideas have gained tremendous support from the council, TDs, the community and local businesses in a very short time. Possible designs are being tirelessly researched, designs that would work sensitively with and enhance our unique and very special coastal environs in Skerries. Skerries Skatepark Committee is also engaging with other committees that have achieved skate parks in award-winning, tourist towns around Ireland and have been working with Fingal County Council to short-list possible locations on Council-owned areas around Skerries. Engagement with the Council has been positive and constructive. Over the past year the Skerries Skatepark Committee have been working closely with the community, Fingal Co Co, local councillors and politicians to create a viable proposal for the addition of a skatepark for Skerries. They are delighted that in July of 2015 the first major hurdle was crossed with the allocation of a site at Skerries Mills by Fingal Co Co as part of the Town Parks Masterplan. The next phase and new focus now is to investigate all forms of possible funding in order to keep the project moving. 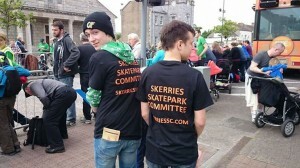 The Skerries Skatepark Committee would like to thank everyone involved in the process for the support and help to date.